The low/depression in the bay concentrated fast and now has attained the strength of a cyclone. Named "Bijli", the cyclone is today (wednessday evening), CENTRED AT , NEAR LAT. 15.00 N AND LONG. 86.50 E, ABOUT 470 KM SOUTHEAST OF VISAKHAPATNAM, 750 KM NORTHWEST OF PORT BLAIR . THE LOWEST CLOUD TOP TEMPERATURE (CTT) DUE TO CONVECTION IS AROUND -60C. THE SYSTEM IS LIKELY TO INTENSIFY FURTHER AND MOVE IN A NORTH-NORTHWESTERLY DIRECTION FOR A DAY, AND THEN RE-CURVE TOWARDS THE NORTH-EAST. The map from JTWC shows the projected path. As mentioned, the recurving is due to the W.D. now over the hilly regions of north India. Also, as the system lies close to an upper ridge, it can recurve as stated. The days in the major part of north/central and western India and adjoining regions continue to be hot, and record "heat wave" temperatures in the north ern states. Map shows a vast region of over 40c, with 44c, the highest Akola. In fact, the storm moving away from the east coast of India, may be "good" in some ways. The "heating of the land mass" can continue uninteruppted now, and the seasonal low may form faster. And, the quick formation of the system in the bay, which ever direction it may move, is a necassary "pre monsoon " requirement for the formation of a subsequent trough. The strong westerly upper winds at 200hpa, too have started moving northwards, though very gradually. 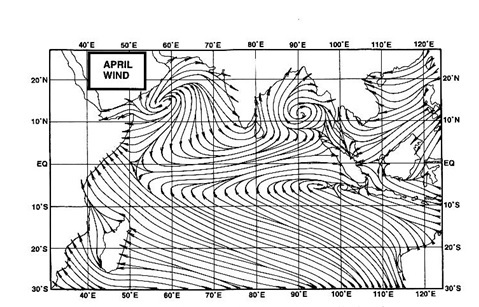 Mild Easterly winds at 200hpa are observed at 8N, the tip of the Indian Peninsula. The monsoon can be estimated to be at the Kerala coast as per the scheduled date. The current W.D. is causing some rains in the hills of H.P. and Utteranchal. Generally, the Kumaon/Garhwal hills get some rain in this month (April) as W.D.s approach the region. After the month of April, when the temperatures start rising, rains will also occur in the hills of Utteranchal due to local convection. This phenomena becomes a little difficult to forecast, and can be done perfectly only by being actually present in the region and observing the clouds formation and wind direction. But overall, a safe forecast can be made for the hills of Utteranchal region 8to10 days in advance. As on today, rain is epected in the Kumaon region only upto the 16th. A comparitively dry spell is pected upto the 25th. at least. a thundershower can be expected on a couple of days in the first week of May. Updated forecast will be posted on this blog.